Ever heard of these girls? Boy Friend consists of two best friends from Austin, Texas, who decided to get together and write music in the winter of 2010. 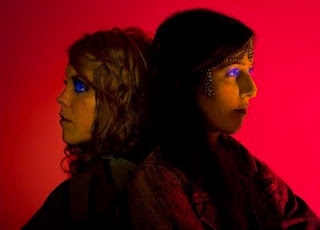 In that time, they have recorded their EP in the bedroom of Christa Palazzolo (one part of the duo) and have just released their debut single, Lovedropper on the Hell, Yes! record label. Blending mystical sounds, smooth electronics and minimalist lyrics, they’ve managed to produce a classic single. Lovedropper is bass heavy but is immensely relaxing. Contradictory? Maybe, but it is. Lovedropper has gentle harmonies made with angelic voices. The music is simple but pleasing. Everything about it works well. This duo have ticked all the right boxes for me. Take a look/listen for yourselves (the video is rather strange and also vertical…don’t ask). BOY FRIEND – Lovedropper (Official Video) from HELL, YES! on Vimeo.